Bengt Halvorson November 18, 2014 Comment Now! Is there the demand for an open-air touring car, sized and priced above the Continental GTC and based on the Mulsanne? 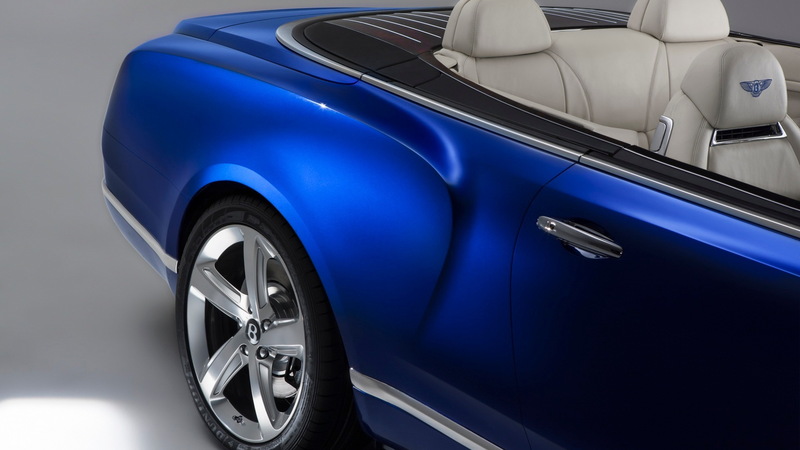 That’s essentially what Bentley is asking with the new Grand Convertible Concept that it previewed at a studio space in West Hollywood, prior to the start of the Los Angeles Auto Show press days this week. The concept actually dates back to 2012 but this is the first time it's being shown to the public. Bentley calls it “the ultimate expression of the British luxury automobile,” and the show car is termed a concept—although it’s fully functional, and based on the look of it, quite production-ready. Shown in what was originally a bespoke color created by a customer’s sequin gown, Sequin Blue, the Grand Convertible has a ‘liquid metal’ finish atop the hood and at the windshield frame. Special directional wheels are hand-finished and polished, and from the side or the rear, the real standout feature is the tonneau, which is made of dark-stained Burr Walnut. 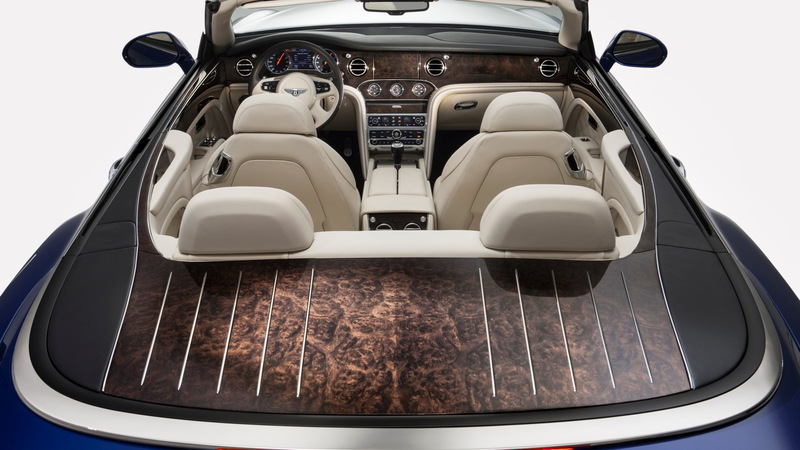 It’s the largest piece of wood veneer ever applied to a Bentley—at least one at Crewe. The interior is as stunning as that of the other Mulsanne models, with plush quilted linen-toned leather upholstery, Sequin Blue accent thread. 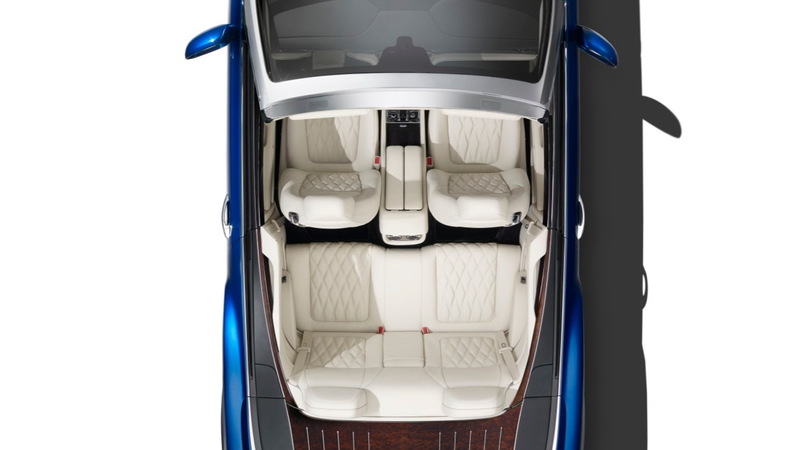 Beluga leather is used for contrast around the tops of the doors, extending back to the tonneau area. Under the long hood and behind that brash mesh-pattern grille is Bentley’s 6.75-liter twin-turbo V-8. With 530 hp and 811 pound-feet of torque, there will be plenty of forward thrust, no matter what the situation. But the Grand Convertible is a bit more than a pretty convertible. According to engineering boss Rolf Frech, target customers for this car will enjoy driving and be more discerning about the driving experience. 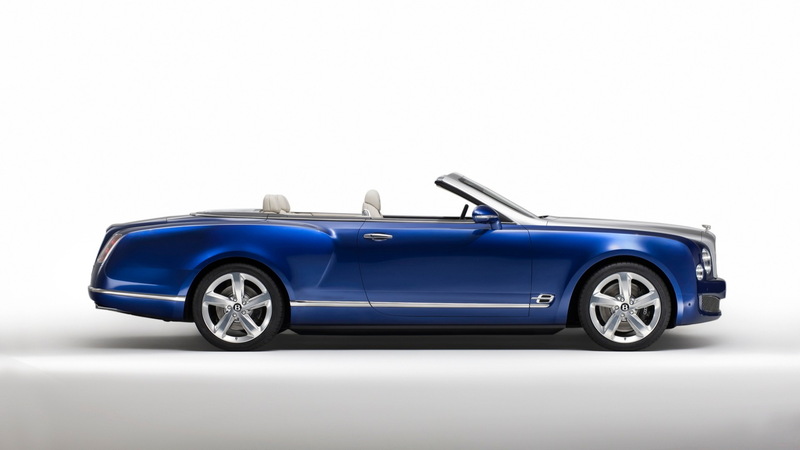 The Grand Convertible Concept is built on a wheelbase that’s 5.9 inches shorter than that of the standard Mulsanne, while a steeper windshield angle helps bring it a roadster-like profile from side angles. And to assure those more sharply honed dynamics, it combines some of the functional upgrades of the Mulsanne Speed with a bolstered structure down below. The automaker notes that it’s developed to signify Bentley’s intentions for the future—and it could arguably raise the ceiling for convertibles and the brand. 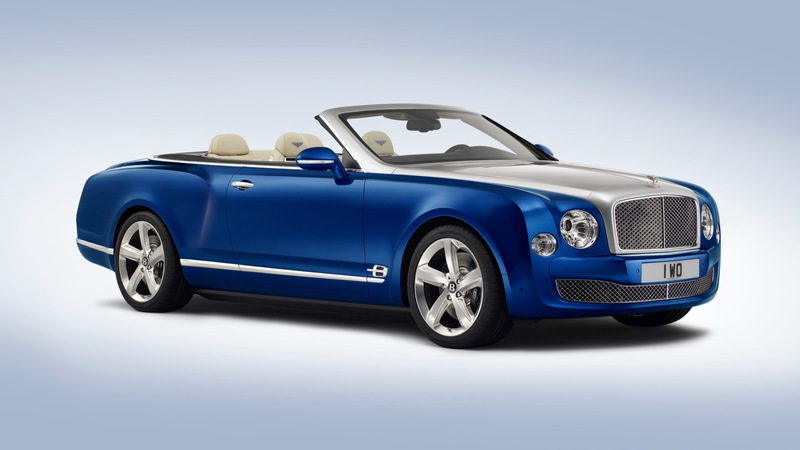 In fact, Bentley's current boss Wolfgang Dürheimer recently said there was strong demand for a range-topping convertible like the previous Azure, and that if a successor for the Azure was launched the former car’s coupe variant, the Brooklands, would get a successor of its own. Check back to see more live photos of the Grand Convertible Concept from the show floor, and don’t miss any of our Los Angeles Auto Show coverage.